This naturally sweetened soda is the perfect refreshment for winter. 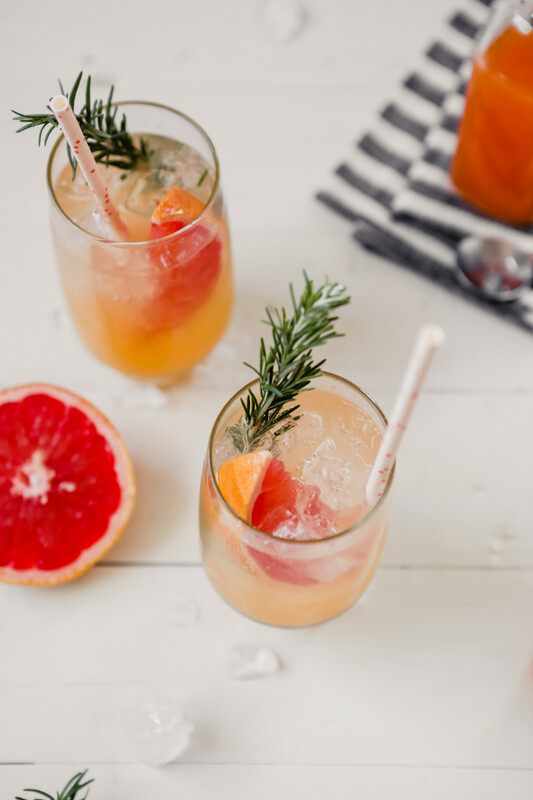 Vibrant in color and flavored with fresh rosemary, this homemade grapefruit soda can be enjoyed as is or spiked with your favorite booze for a delicious anytime cocktail. So a cold, refreshing drink is supposed to be seasonal this time of year? Oh, yes! Ruby red grapefruit are at their peak during the cold winter months and you bet I’ll be taking advantage of that. Ruby red grapefruit may be darker in color than their pink relative, but that doesn’t always mean they’re sweeter or less bitter. So for this recipe you can use whatever you prefer or can find, I simply prefer the ruby variety for their gorgeous color. How do you make grapefruit soda syrup? Making homemade soda syrups is very easy and follows a similar method to making simple syrup. Not sure how to make a simple syrup either? Don’t worry, we’ll break it down! Making a simple syrup is, well, simple! As a rule of thumb, simple syrups are made by dissolving 1 part sugar (granulated) into 1 part water (1:1). To dissolve the sugar into the water you bring the sugar and water to a boil in a small saucepan over medium-high heat. Once the mixture is boiling, and the sugar has dissolved, remove the pan from heat and let the syrup cool completely. See? Simple! When making a soda syrup, I recommend replacing most or all of the water with fresh fruit juice. Why? Because when it comes to making homemade sodas, you want them to be as flavorful as possible. And since fresh fruit juice already contains natural sugar you can often get by with using less sugar, but that depends on your preference. If it’s your first time making a soda syrup, stick with 1:1 ratio of fruit juice to granulated sugar. From there you can switch up the amount of sugar to suit your preference. How do you make naturally sweetened soda and cocktail syrups? Making naturally sweetened soda syrups are my jam! I love making drinks and cocktails with natural sweeteners as opposed to refined sugars because it’s natural and more wholesome. Additionally, natural sweeteners like honey, maple syrup, agave and coconut sugar offer more flavor than granulated sugar or corn syrup, making drinks and cocktails unique and dimensional. Since honey and maple syrup are bold in flavor, I recommend starting with a 1:2 sweetener to water ratio—especially if you’re making a specific flavor of soda syrup—so it doesn’t take over as the main flavor. However, if you’re looking to make a honey- or maple-simple syrup, go right ahead and stick to the 1:1 ratio. Again, it’s all about preference, so experiment and find what works best for your tastebuds. 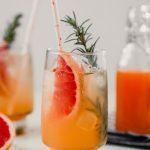 What alcohol (liquor) goes with grapefruit soda? It’s more like what doesn’t go well with grapefruit soda. I’m only kidding. Kind of. 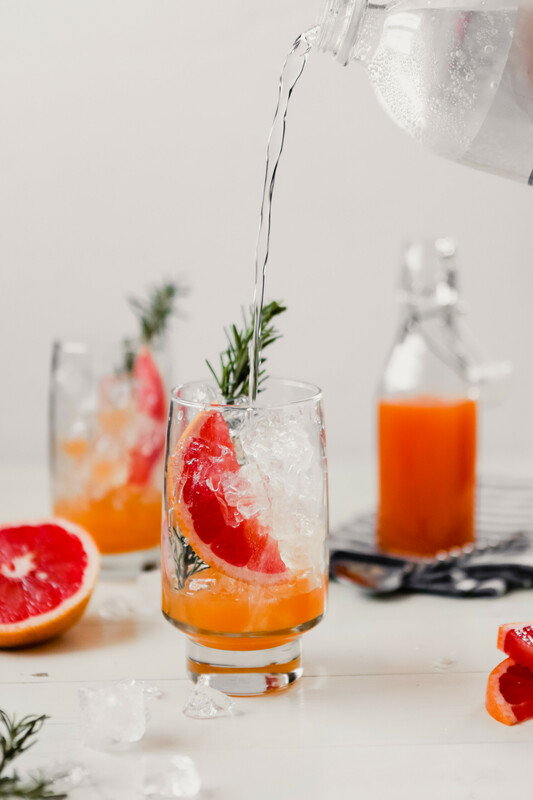 If you’re looking to spike this grapefruit soda you have quite a few options to choose from! I would stick with light liquors like tequila, vodka and gin. 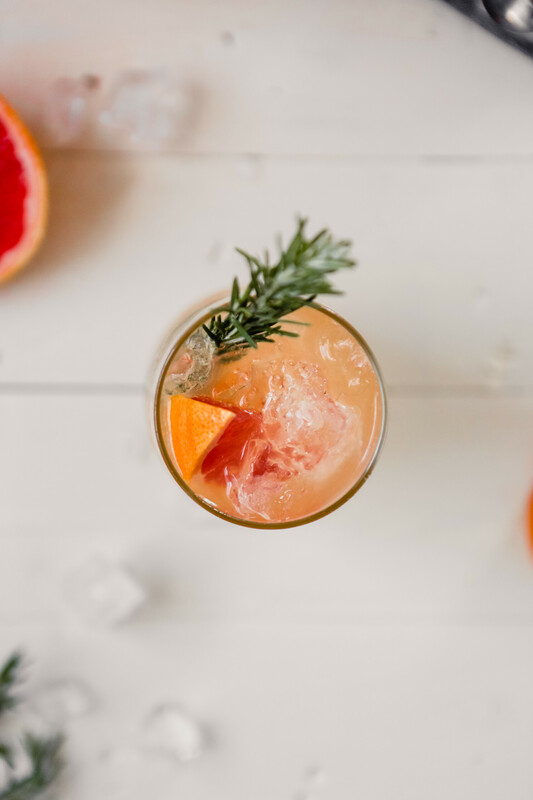 Combine 1½ ounces tequila blanco, 1 ounce fresh lime juice and 1 ounce grapefruit syrup in a lowball glass, fill glass with ice and top with chilled club soda. 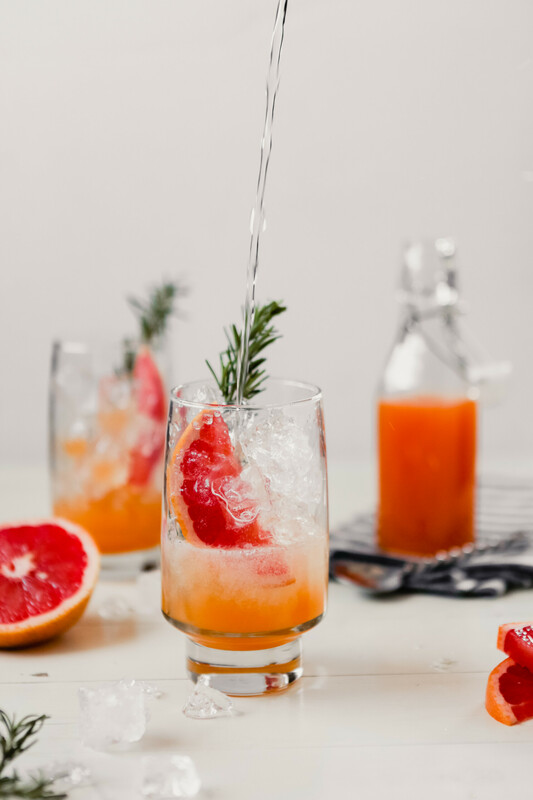 Combine 1½ ounces gin and 1½ ounces grapefruit syrup in a lowball glass, fill glass with ice and top with chilled club soda or cava for something a little more boozy! Combine 1½ ounces citron vodka, 1½ ounces grapefruit soda and 1 ounce lemon juice in a lowball glass, fill glass with ice and top with chilled club soda. 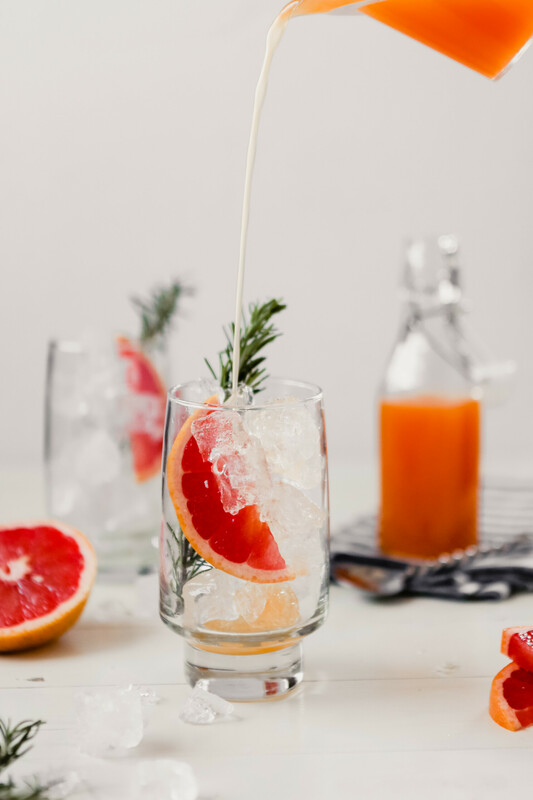 Pour 1 ounce grapefruit soda into a champagne flute and top with chilled dry cava or prosecco. This naturally sweetened soda was developed to be served alongside my Ricotta Toasts with Sautéed Apples. You can check out the menu overview or grab the recipe for the apple toasts! This soda is also great served on its own or alongside any sandwich or salad. 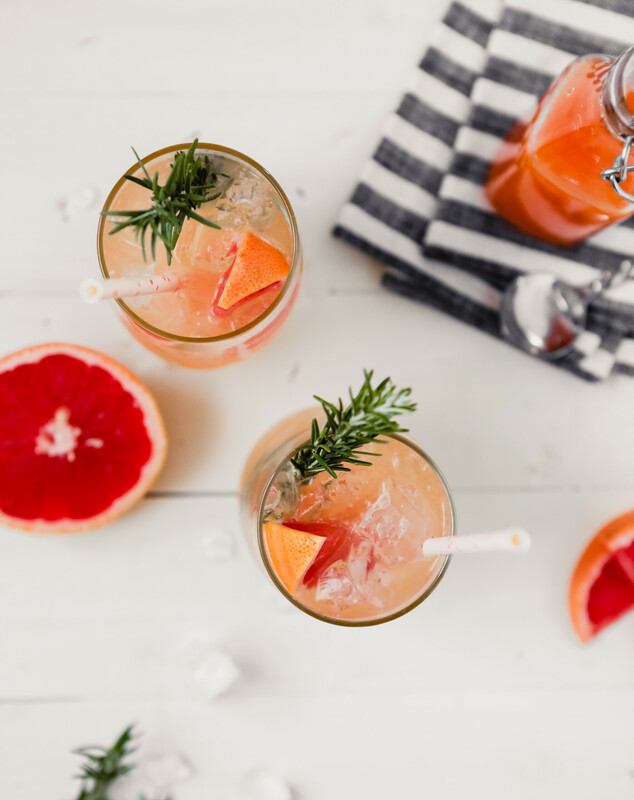 This grapefruit soda, made with a naturally sweetened simple syrup, is a great anytime drink. Add a splash of booze and you’ve got a quick, low-sugar cocktail! Bring zest, grapefruit juice, honey, lemon juice and rosemary sprigs to a boil over medium-high heat in a small saucepan. Remove from heat and let mixture steep for 1 hour before straining through a fine mesh sieve. 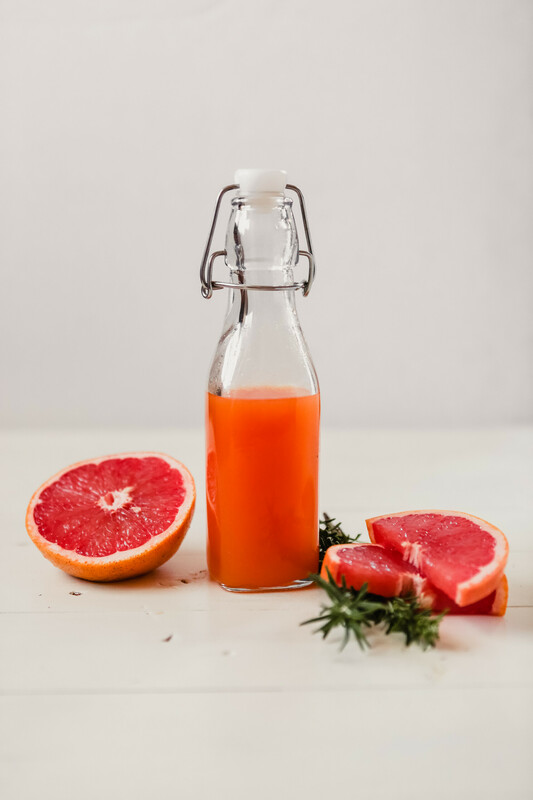 Store grapefruit-honey syrup in an airtight glass container in the refrigerator until ready to use. 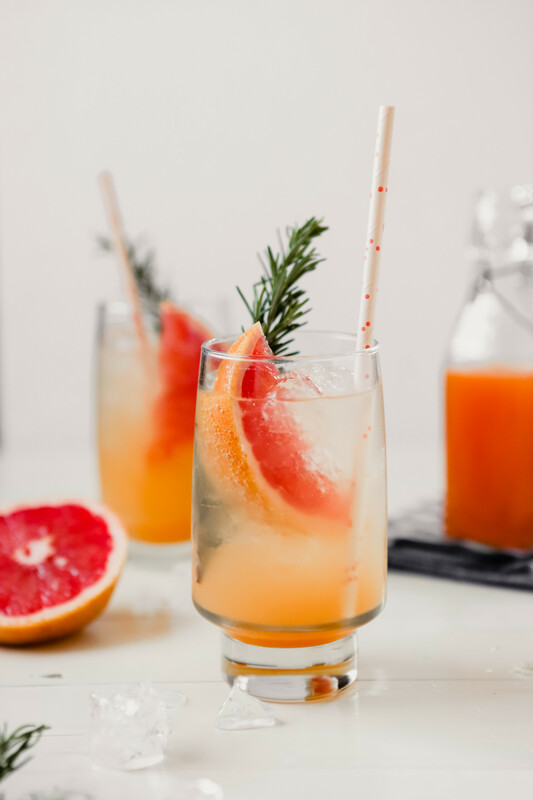 To make a soda, combine 2 tablespoons (1 ounce) grapefruit-honey syrup with 1 cup (8 ounces) chilled club soda. Add more or less syrup to taste. Soda syrup should last up to 2 weeks in an airtight glass container stored in the refrigerator.